Like many others, I decided to read The Mortal Instruments series by Cassandra Clare when the previews for the movie came out. Now, I know die-hard fans of the books have mixed feelings about the movie–I blogged about that here–but I’m glad I waited to read this series until almost all of the books were out because, man, can Ms. Clare write some major cliffhangers! As a result, I read the first three books, then waited to read the last three until the final book came out. However, I didn’t realize that her other series–The Infernal Devices–was connected until something very interesting happened in CITY OF HEAVENLY FIRE that was clearly a reference to something I should have known. It was done cleverly, in such a way as to be sort of spoilerly but not completely spoilerly, but even so, I went into the series 90 percent sure of the outcome, and I turned out to be right. 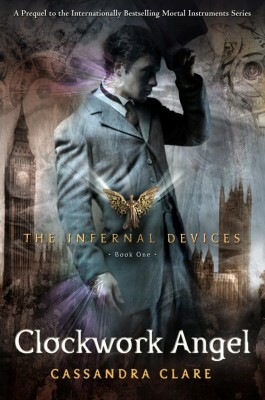 I still loved it, but I’m putting it out there to warn you to read The Infernal Devices series before CITY OF HEAVENLY FIRE. Okay, on to the recommendation, starting with the description for the first book in the series. 1. The mix of genres – It’s steampunk and urban fantasy and historical all rolled into one. I guess steampunk is already historical, but you get my drift. While the demons and supernatural were still prevalent, this series was much more about invention and intrigue. I found it kind of amazing how it all worked together. 2. The literary references – I was an English major, so I loved the parallels the characters drew to A TALE OF TWO CITIES and the conversations about other literary works. I even enjoyed the poetry at the beginning of the chapters, and I’m not usually a poetry person. 3. The supporting characters – Ms. Clare’s books always have a large cast of characters. Sometimes I wish we wouldn’t jump to another character when I want to stay with a particular one, but she draws them all so well, even the minor characters. One of my favorites in this series shows up in the second book–Bridget, the cook, who sings the most inappropriate songs at the most appropriate times. Or is it the other way around? 4. The heartbreaking twists – Cassandra Clare has a unique flare for throwing a wrench in a story and then twisting and twisting. These books made me cry more than once, and that’s not usually something I’d say I love about a book, but for some reason I do with these. They earned my tears. As much as I loved these, I wouldn’t recommend them for younger YA readers. There is some older content. Are you a Cassandra Clare fan? What’s your favorite twist? If you haven’t read her books yet, don’t read the comments, just in case someone spills! That might have been a better order to read in! I definitely wouldn’t have been spoiled then :). Oh well. If you start reading these, I’ll warn you that the final book of the six leads in to her next series, so they don’t stop! I know what you mean about the reading pile. It’s never-ending!